One Touch delivers the freedom of choosing your favorite applications for task-specific functions with your choice of the leading practice management systems. Your clinic relies on accurate coding, billing, and detailed record keeping to generate revenue. You likely have a practice management/billing system already in place, one you and your staff know and trust. One Touch EMR allows you to “link” your patient data and visit documentation with your existing PM system, allowing seamless integration of information with no need for duplicate data entry. Since One Touch EMR operates in "real time" synchronized with your PM, when anyone in the practice enters information into one system, it will automatically show up in the other, saving time and reducing errors without sacrificing practice efficiency. 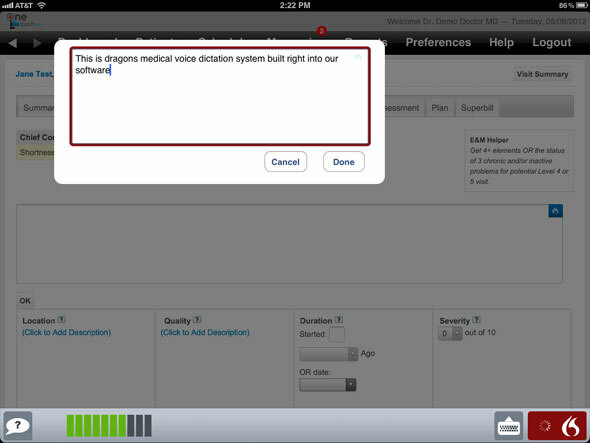 Electronic Patient Records – Implement simple conversions from previous systems. Practice Management – Use ours or use your own! Coding and Billing – Stick with what works; you don’t have to make major changes. Lab Orders – Order and receive results from all major reference labs and local labs too! Prescriptions – Utilize certified Surescripts e-prescribing and interaction alerts. Appointment Reminders – Keep your office running smoothly. Document Management - Find what you need at the touch of a finger. Review our growing list of integrated PM and EMR systems. We interface and "talk" to over 70 popular practice manager and competitor systems for quick and seamless integration into your office! Allows seamless and quick integration into your office.